On the heels of a trio of eye-popping contracts handed out to MLB stars in the last month, another perennial All-Star is reportedly on the verge of signing his own extension. Only the figures aren't quite as gaudy. The Athletic's Ken Rosenthal reported Thursday that the St. Louis Cardinals and newly acquired first baseman Paul Goldschmidt are closing in on an extension that will be "at least five years and at least $110 million." Later, ESPN's Jeff Passan reported that both sides agreed to a deal and the terms are five years and "about $130 million." 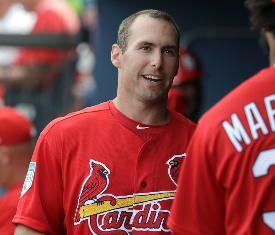 The deal, Passan reported, would keep Goldschmidt in St. Louis through the 2024 season. In the past month, Manny Machado (Padres), Bryce Harper (Phillies) and Mike Trout (Angels) have signed three of the four largest contracts in MLB history, each worth at least $300 million in total value and $25.3 million in annual average. Goldschmidt's deal would be a far cry from those in terms of total value, but at 31, the slugger is several years older than the others. Machado and Harper are 26, and Trout is 27. Goldschmidt has slugged 30 or more homers in four of the past six seasons, but the Diamondbacks were shopping the 31-year-old because he was entering the last season of his contract, which is slated to pay him $14.5 million. He batted .290 with 33 homers and 83 RBI in 2018. He has three 100-RBI campaigns and has batted .300 or better three times since 2013.